Sculptures leaping off citadels? What will we see next? | Where to next? 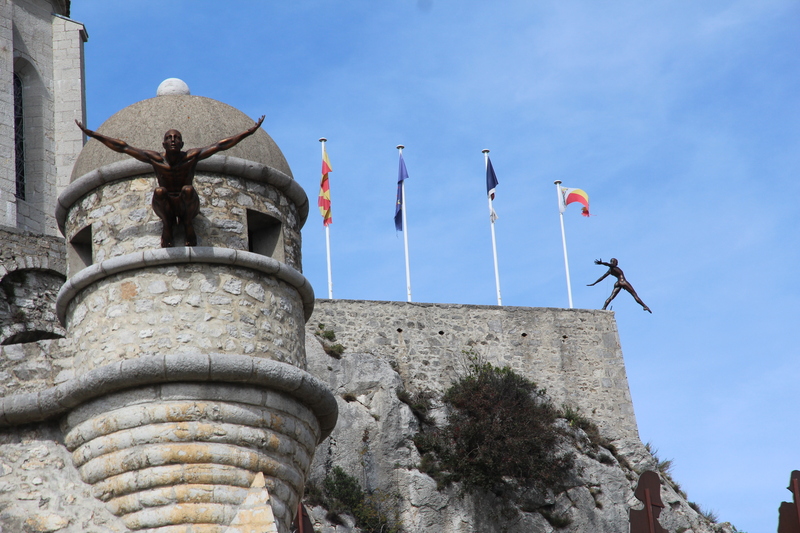 Sculptures leaping off citadels? What will we see next? 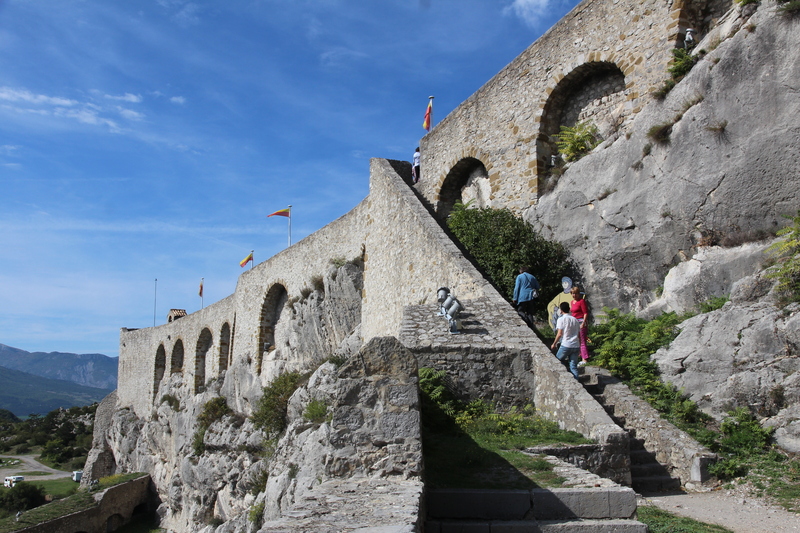 We’ve seen quite a few citadels in our travels, but nothing prepared me for the impressive show at the lofty citadel at Sisteron in southeastern France. It wasn’t just the imposing citadel and chapel that overwhelmed. The views from the top are sweeping and breathtaking, and the sculpture show that has just ended (sorry, but I only just got there in time) was one of the most awe-inspiring I have ever seen. But first a bit about the citadel. The rock on which is sits overlooks the Durance River and history says that some sort of fortress has been there since early days—probably for 4000 years. None of those original structures remain, but the upper rampart of today’s citadel was built in the 13th century. It’s easy to see why it was a popular choice for a lookout and stronghold. What a vantage point. You can see for miles and miles in virtually every direction. Over the years, the fortress has been modernised and remodeled as needed. But the biggest renovations came after World War II. On 15 August 1944, French and American bombers tried to destroy the railway bridge and road bridge that spanned the Durance. The weather was poor and the mission failed. But one bomber, in trying to avoid a collision with another, dropped several bombs on the town, causing about 100 deaths and seriously damaging many structures, including the citadel and 15th century chapel. When we visited the chapel, called Our Lady of the Castle, it had several exhibitions, including one of photos showing the damage and subsequent rebuilding. The chapel stopped having a religious role within 200 years. Instead it became a dungeon and later a prison. I’m still wondering how something so high up could be called a dungeon. 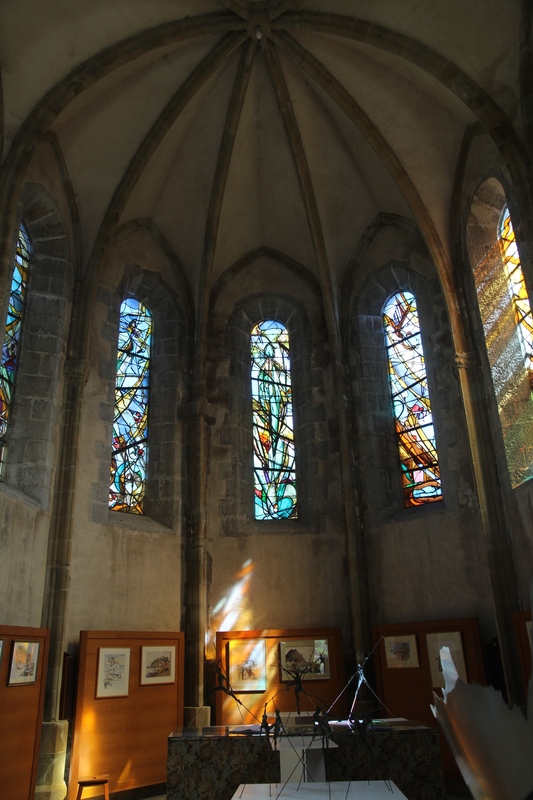 The chapel was restored in the 1930s and stained-glass windows were added, but all this was lost in the 1944 bombing. The restoration included new windows by artist, Claude Courageux. But the artist of the day—well the artist of this northern summer—is a man named Nicolas Lavarenne. He created 11 sculptures to be exhibited at the citadel between 8 July and 27 September. These life-size figures celebrate the human form and have been, I suspect, created specifically for this location. The way they fit into the spaces is incredible—stepping off buildings, hanging from walls, enjoying the view and entering into combat. I’ve read a bit about Lavarenne. Born in 1953, he is a self-taught artist who specialises in human forms and movement. If you’re desperate to have one, here an art house in London with some for sale. Even the small ones aren’t in my price range, but I love looking at them. I added names to the sculptures below (except for one that I can’t figure out). And if you need a hit of French food, check out the recipe for salad niçoise on my cooking blog. Those statues are wonderful! I can imagine them on a world tour climbing & leaping off of famous (and not so famous) building and landmarks. Great artistic imagination. Thanks for the viewing. I think the sculptor has done exactly that. If you google his name you’ll see this is the type of work he does regularly. Those sculptures surely do suit that site. I wonder where he’ll place them next? You could volunteer your back yard. Brilliant idea. I’ll get to work on it now. I can imagine one jumping off the garage. Love the placements of the sculptures. Very lively, some look as if they are attacking the citadel and some fleeing as if it were under attack or on fire. Yes, the placement is perfect. Riveting to look at. Che belle sculture. Una bella idea! Thanks so much. I like your blog posts too. Excellent write up on this historic site. I love the sculptures and they are unfortunate you were there for the end however you brought your eloquent touch giving your readers a fine sense of the citadel, it’s great history and beauty. Imagine had the sculptures been in place at the time of WWII, they’d sadly have given our Nazi foes something aim their guns at! Let’s hope ISIS/ISIL never makes it this far as undoubtedly they’d find a reason to take this and other citadels down to rubble. Glad you liked the post. I hope these sites are safe. Thanks a lot, most appreciated. I hope your network of artists like it. You’re right. The placement was perfect. Yep, unreal, that’s the perfect word for them.